1880s autograph album of May Starr of Wilbur, Oregon, in Douglas County. The album is a large one, approximately 8-1/2" x 7" and contains 96 pages of sentiments from May herself, her relatives and friends. 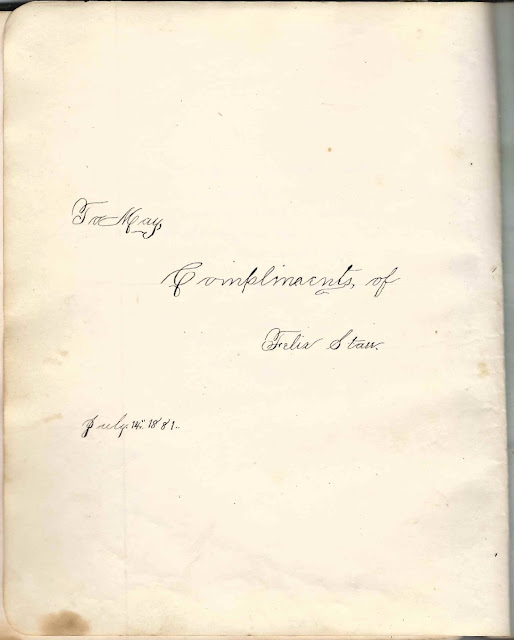 Many of the signers filled the entire page. The pages are very wrinkly and didn't scan well. Several of the signers were students at Oakland Academy and Umpqua Academy in Oregon. May Starr was born 6 July 1862 in Douglas County, Oregon, the daughter of Felix and Icephene (Willits) Starr, who were born in Virginia and Indiana, respectively. May's parents had come to Oregon from Indiana in an ox cart. Her father later returned to Indiana to acquire a herd of well-bred horses, which he drove to Oregon. The name Starr was a variation of the German name Stoehr, which had turned into Stehr, Stair and Starr in the United States. Some of the signers in the album were named Stair. I found an extensive history of the Stoehr family here. It includes an account of May's family's move west. 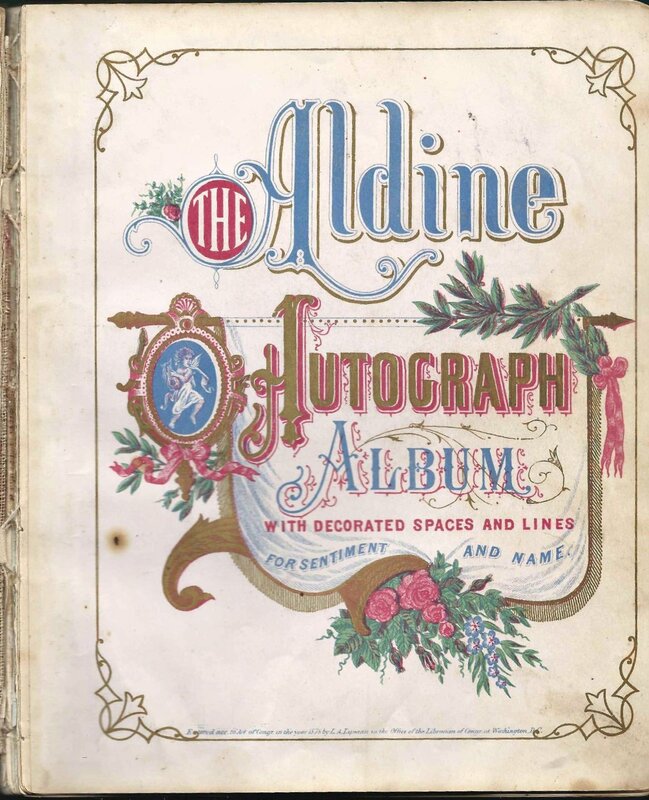 In the Centennial History of Oregon, 1811 to 1912, Volume 4, a biography of May's future husband, James L. Cole, also has insights into the Starr family. 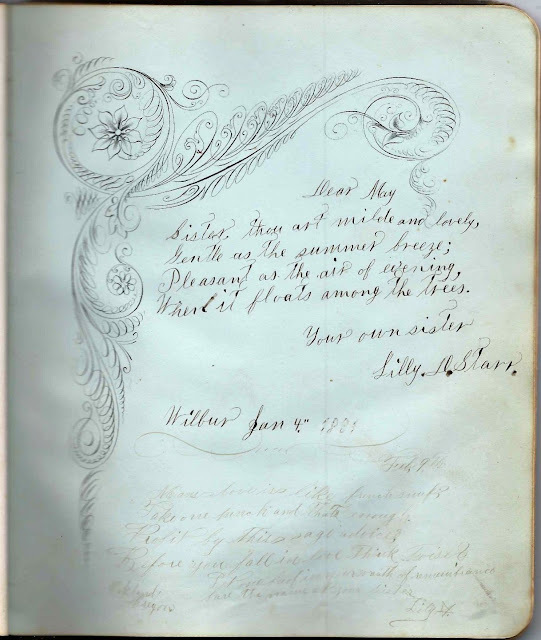 May's sister Lilly and brothers Felix and James signed pages in her album. 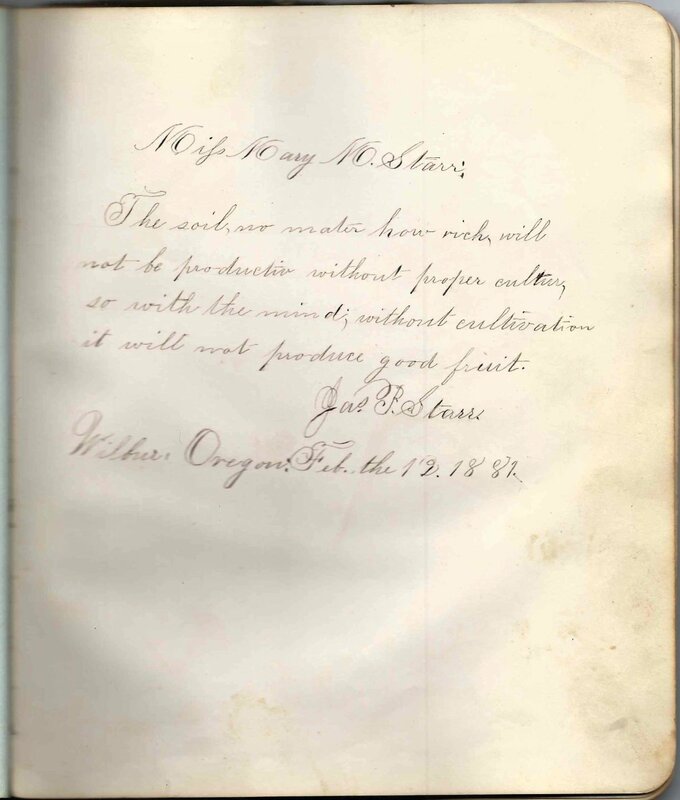 Sister Lily D. Starr of Wilbur, Oregon, signed a page on 4 January 1881. There's a later message from Lilly on the same page where she signed her name as Lilly and a "star" symbol. May's brother Felix Starr signed a page on 14 July 1881. May's brother James P. Starr of Wilbur, Oregon, signed a page on 12 February 1881. Many other relatives from Oregon and Indiana signed pages. Refer to the list below. On 25 November 1886, May married James L. Cole, son of James C. and Louisa (Leeper) Cole. He was born 21 September 1860 at Coles Valley in Douglas County, Oregon. James and May lived in Douglas County, Oregon, eventually at May's father's farm. They had, I believe, four chidren, three of whom lived to adulthood. 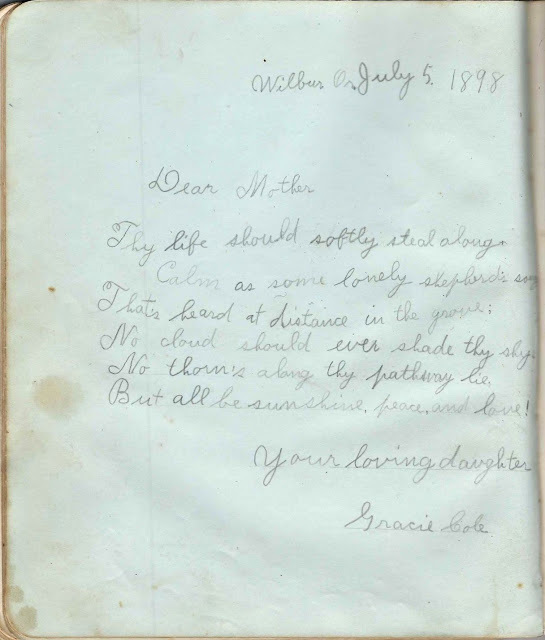 Their first child, Grace May Cole, signed a page in her mother's album. 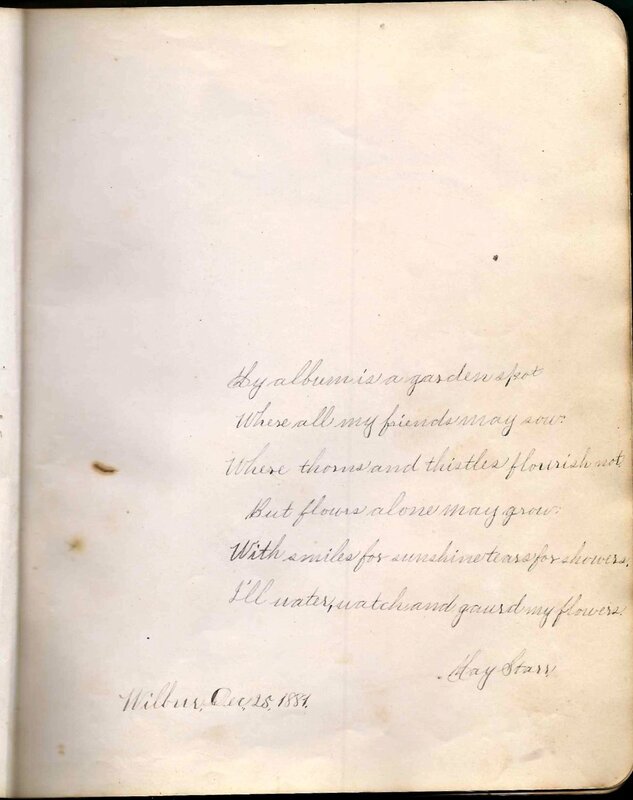 Susie, undated but written after May's marriage on 25 November 1886, or on that day, as it's inscribed to Mrs. May Cole. Mattie, signed on 6 August 1909. "This in remembrance of the summer of 1909, from the little white-haired cousin you knew in Indiana in 1882. With much love, Mattie. May's cousin. J. Q. Adams. Too late in the game for THAT J. Q. Adams! "Remember me and my best wishes when you are at home washing dishes"
"Your loving daughter, Gracie Cole". Grace May Cole, daughter of James and May (Starr) Cole, was born 3 December 1885 at Oakland, Oregon. Silas W. Cunningham, signed 6 August 1909; May's cousin. This was Silas Willits Cunningham, whose mother Margaret Ann (Willits) Cunningham was a younger sister to May's mother Icephene (Willits) Starr. Lydia Cunningham of Brookston, Indiana, signed on 7 August 1909; May's cousin. Lydia Cunningham's mother was Margaret Ann (Willits) Cunningham, younger sister of May's mother Icephene (Willits) Starr. 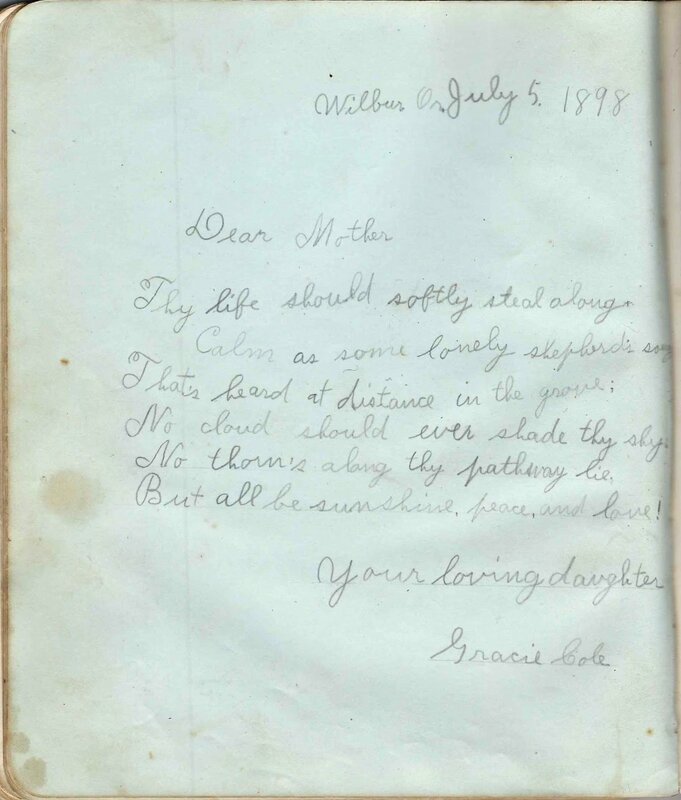 Nettie Davis, signed at Wilbur, Oregon, on 13 February 1898. "Not like the rose may our friendship wither. But like the evergreen live forever." Rosa Green of Wilbur, Oregon, signed on 22 February 1881. Page is shared with the sentiments of a friend who left a sentiment in November 1884. Felix Starr, signed on 14 July 1881. Felix Starr was May's younger brother. Her father, Felix Starr Sr., had died by this date. 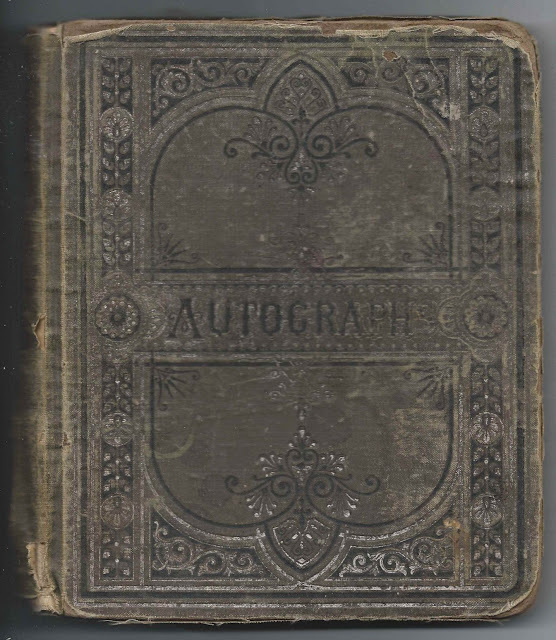 Lou Starr of Transitville, Tippecanoe County, Indiana, signed on 4 April 1882; May's cousin. Lilly D. Starr, signed at Wilbur, Oregon, on 4 January 1881. She wrote another message in pencil at the bottom and signed it Lily with a "star" symbol. James P. Starr, signed at Wilbur, Oregon, on 12 February 1881. He was May's older brother. Becca E. Williams. There was a Rebecca E. Williams who lived at Wilbur, Oregon.